In one of the first studies to examine how the loss of forest birds is effecting Guam’s island ecosystem, biologists from Rice University, the University of Washington and the University of Guam found that the Pacific island’s jungles have as many as 40 times more spiders than are found on nearby islands like Saipan. “You can’t walk through the jungles on Guam without a stick in your hand to knock down the spiderwebs,” said Haldre Rogers, a Huxley Fellow in Ecology and Evolutionary Biology at Rice and the lead author of a new study this week in the open-access journal PLOS ONE. 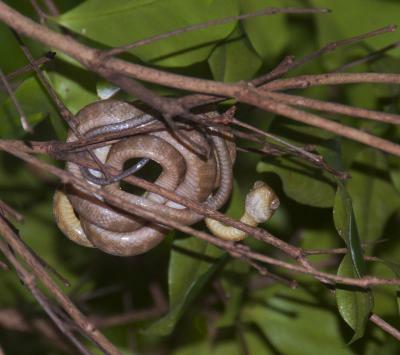 The results are some of the first to examine the indirect impact of the brown treesnake on Guam’s ecosystem. The snake, which was accidentally introduced to the island in the 1940s, decimated the island’s native bird species in one of the most infamous ecological disasters from an invasive species. By the 1980s, 10 of 12 native bird species had been wiped out, and the last two live only in small areas protected by intense snake-trapping. Rogers and colleagues are investigating whether the loss of birds led to an increase in the spider population on Guam, since many birds consume spiders, compete with spiders for insect prey and utilize spider webs in their nests. Small-scale experiments in other ecosystems have consistently shown a link between the presence of birds and the abundance of spiders, but the new study is the first examine the impact of bird loss on the scale of an entire forest. Counting spider webs on Guam and on nearby islands in the Marianas Islands chain was the first step. Rogers said the difference between the number of spiders she and her colleagues counted on Guam and three nearby islands that still have birds “was far more dramatic than what any small-scale experiments had previously found.” She said the findings underscore the importance of using both observed counts and controlled experiments when attempting to predict how entire ecosystems will react to change. Rogers landed her first job out of college on Guam in 2002. “I had no idea where it was,” she recalled. “I had to look it up on a map.” She quickly fell in love with the narrow, 30-mile-long island, a mecca for tourists who are drawn by the tropical island’s beaches, diving and snorkeling. Guam is a U.S. territory, and to prevent brown treesnakes from spreading to other islands, the U.S. spends more than $1 million a year searching airplanes and cargo to prevent the snakes from escaping Guam. However, the reclusive, nocturnal reptiles are extremely hard to find. Rogers said the average resident or tourist on Guam will never see one, and even those who actively hunt them are hard-pressed to find one, which is one reason the snakes have been impossible to eradicate from the island. Rogers’ first job on Guam was to lead the U.S. Geological Survey’s brown treesnake rapid response team, a small group of snake hunters charged with capturing brown treesnakes that manage to get off the island. Specifically, the team’s mission is to respond within 24 hours of any sighting of a brown treesnake on any island that is served by flights from Guam. “When I was out there searching for snakes at night, I spent a lot of time thinking about the differences between the forests I was walking through and the forests back on Guam,” Rogers said. The spiderwebs were just one difference. The lack of songbirds also make Guam’s forests eerily quiet during the day, she said. By the time Rogers enrolled in graduate school at the University of Washington in 2005, she had a number of ideas for ecological field studies aimed at measuring and explaining the differences she’d observed. One of the first experiments she had in mind was to investigate all those spiderwebs, which are much less plentiful elsewhere in the Marianas. “I certainly wasn’t the first to notice the incredible number of spiders in the jungles on Guam, but we were the first to quantify the difference between Guam and nearby islands,” Rogers said. Historically, if ecologists wanted to study how insects reacted to the absence of birds, they would build an “exclosure,” a covering designed to keep birds out of their study area. Rogers said most exclosures cover a few branches of one tree, and, in rare cases, an entire tree. Building structures large enough to exclude birds from an entire forest simply isn’t affordable, so the brown treesnake has effectively set the stage for experiments that ecologists couldn’t otherwise do. To find out exactly how many spiders were on the island, Rogers’ team grabbed a tape measure and spent four months hiking through jungles counting spider webs, as a proxy for spiders. She and study co-authors Janneke Hille Ris Lambers and Josh Tewksbury of the University of Washington and Ross Miller of the University of Guam found that spiders were between two times and 40 times more plentiful on Guam than on neighboring islands. Rogers said the results were a surprise, because they were several times more than would have been predicted from simply scaling up the numbers from small-scale exclosure studies. In future work, she plans to conduct exclosure experiments on neighboring islands that still have forest birds and compare those results with observations on Guam to determine the exact links between the lost forest birds and the spider population increases. That was a very interesting articule. My Dad was stationed there when I was a kid. He told stories about a funny bird that was there.